The Viro ransomware is a computer infection built using the Hidden Tear platform, which was originally created to educate people about ransomware. Cyber criminals have already abused Hidden Tear to create infections the operations and purposes of which vary. The Viro ransomware is seemingly in development since it does encrypt files. Moreover, the infection does not create any .txt files containing information about the way the victim should make a payment. Although the Viro ransomware does not enrypt files, it does alter the background of the desktop. 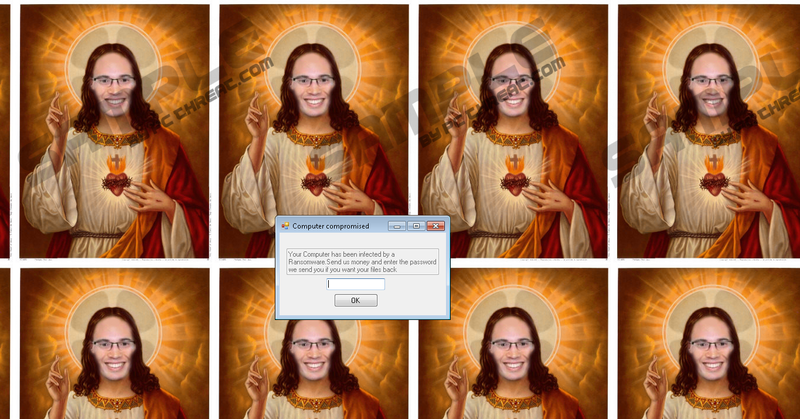 The image set as the wallpaper contains multiple images of a young man wearing glasses and illustrated as Jesus Christ. The reason for using such a religion figure remains unclear, but that does not change the fact that the infection should be removed from the computer. The Viro threat is not capable of encoding various files, but it is capable of recording users' browsing behavior. The analysis of the code has revealed that Viro could be programmed to operate as a worm and keylogger. At the time being, the infection cannot record passwords and cookies stored on the browsers, but it can record the websites you access. The open-source code Hidden Tear uses AES encryption to encode files in the directory "\test" on the desktop. This feature was abused by skilled fraudsters to encrypt files located in other directories. Some .txt files could be also created by Hidden Tear-based infections. An infection built using Hidden Tear is relatively lightweight since its size is only 12KB. Such a file size enables attackers to spread the infection through phishing emails, which are deceptive emails created to look as if they were sent by service providers or people from your email contact list. The developers of Hidden Tear foreseen the abuse of the script and had deliberately incorporated a flaw into the code. Nevertheless, the education-oriented code has already caused some havoc among computer users. For example, there is a Hidden Tear-based infection which demands participation instead of a ransom. Named RensenWare, the infection encrypts files and demands that the victim play the game "TH12~ Undefined Fantastic Object" to restore the data encrypted. No additional information is given or displayed by the infection, which again implies that someone is trying their programming skills. Even though the Viro ransomware does not pose any serious danger, you should be aware of the fact that there are thousands of more dangerous infections, which can dramatically compromise your computer. If you keep your operating system unprotected, you risk losing your valuable data, including documents, video files, pictures, passwords, and other information that could be the target of identity thieves. Our advice is to remove Viro and shield the system against other threats. It is also worth considering your Internet browsing habits so that you can prevent yourself from getting targeted by cyber attackers. Malware, including ransomware, is distributed through various channels, including phishing emails, spam emails, software distribution websites, etc. If you want to minimize the risk of getting affected, you should be critical to free software sharing websites and emails received from unknown or questionable senders. Moreover, you should always keep the operating system, as well as software, updated. Eventually, you should make sure that you use a reputable malware and spyware prevention program which can fight off multiple threats. When it comes to malware removal, it is always recommended to rely on specialized software so that no malicious files are left on the computer, as opposed to manual malware removal which may cause some difficulties to the user. The Viro ransomware can be removed manually without technical skills, because it is enough to remove the file launching the infection. However, the executable file of the threat could be located in various directories. Our removal guide should help you check the most common locations where downloaded files are stored. Type in Downloads. Click OK.
Repeat step 1 and type in %Temp%. Click OK. Check the Temporary folder for questionable files. Check the desktop for files that might be related to the Viro ransomware. Quick & tested solution for Viro Ransomware removal.